Wow, I've literally been meaning to write this review for over a month, how sad is that? Especially when we are dealing with a respectable product here. Blue Bunny sent me a few coupons to get more blue bunny stuff on the blog, and then they sent a few more for the blog's two year anniversary, and how do I show my gratitude? by stuffing my face and making a mess, that's how! I spied the variety pack of Blue Bunny Champs at Market Basket and I knew that was the way to start using these free coupons. You get 2 hot fudge, 2 caramel, and 2 vanilla champs. Sounds like a winner to me! I know, big surprise, I went for the hot fudge first. Now that I've had all three, I can honestly say the hot fudge is the champ of this champ variety pack. I bet you are looking at that cone and thinking "Wow, that sure is a lot of peanuts on top!" and you are right! The only major flaw this treat has is those peanut chunks right there. They have a lovely crunch and a nice, fairly-fresh taste, but man, there are just too many. To be clear, it's not that the peanut taste is overwhelming, it's just that they totally complicate the eating of this cone. I find myself taking large bites to try and avoid the inevitable mess of chocolate and peanuts that hits the floor (and my shirt... and my pants...). It's just no fun trying to bite through all the chunks. They are small, hard, immovable chunks and that's how they are going to feel when you bite down on them. I thought I've had drumsticks with too many peanuts, but this is way past that. I've complained about drumsticks because the peanuts tend to flake off and make a mess, but here they are more of a defensive weapon. However, if you can get past the annoyance of biting through the top shell, overall, you will be satisfied. 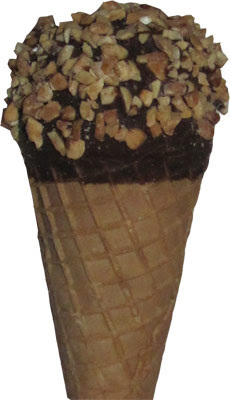 The "hot fudge" of the hot fudge champ is a thick sauce going through the center of the cone and it really compliments the chocolate shell as well as the chocolate lining inside the cone. Ok, I basically just described a drumstick didnt I? I mean, the champ even has that wad of chocolate sauce at the very bottom of the cone... though you could easily just blame this on the manufacturing process - how hard would it be to not have the little chocolate puddle at the bottom? The cones have been crunchy and are tasty to boot. The whole thing comes together very nicely. 2nd favorite flavor? The caramel. I don't love it because I think the caramel overrides the chocolate coating and chocolate lining, but it's not bad. Last place? The vanilla. After you have the hot fudge, the vanilla flavor just seems boring. You keep waiting for something to happen but it just doesn't. I guess I would recommend eating these first, then you won't know what you are missing.... weird, according to the blue bunny website, you can get a box of caramel champs but you can't get a box of just hot fudge champs, that seems wrong. So, as I near the end of the box with just one vanilla cone left, I do find myself a bit sad that they are almost gone. Yes, the peanuts do complicate things, but I'm a sucker for an otherwise well made crunchy cone treat... you know, I think I need to try the chocolate champs next.